A shower wheelchair makes bathing a safer and easier task while limiting the need for assistance from caregivers. For people with limited mobility, it also helps reduce the risk of slipping on the shower or bathroom floor. 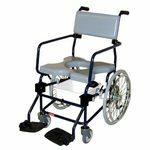 Sometimes referred to as rehab chairs or commode chairs, shower wheel chairs are lightweight and highly transportable. They are usually made of a combination of plastic and rustproof steel. Some models are foldable, making them convenient to store and move from one location to the next. Shower or rehab chairs typically come with arm rests that are simple to remove for convenient transfer to and from your mobility chair, and to allow for easy washing. Some models feature swing-away or drop-arm construction, providing the same benefits. Footrests are typically adjustable and may be designed to swing away or be removed, based on the user's needs. Depending on the model of rehab chair, you can find shower chairs with padded seats, arms and backs. Most chairs are height-adjustable so the user can reach the shower and water controls without risk of falling. Some types have flat seats while others have seats shaped like commodes that allow for easy access to the bather's underside. You will also find shower chairs that tilt and offer other comfort and access adjustments. A rehab wheelchair needs to be used with an accessible roll-in shower stall. It must also be be small enough to fit into the opening of the doorway to the bathroom and shower stall, enabling the user to easily wheel in and out without a caregiver's help. If you are considering a purchase, pay attention to the available seat sizes to ensure a good fit. A rehab chair's weight capacity is another factor to take into account during the selection process. For more information on accessible showers and baths, please see the links below.